It's April and the wood is decked out in its Springtime finery. A vivid new canopy and a stunning carpet of Bluebells. Out for their first run of the day, these two handsome Collies pause briefly on the path, waiting for their mistress to catch up. 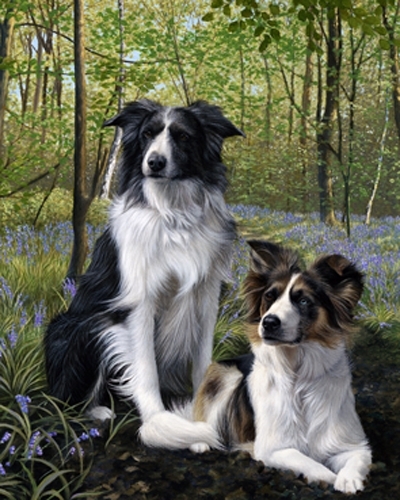 This image of Storm and Breeze, a commission I completed towards the end of 2011, just begged to be published. Not only because the subjects were so appealing - I haven't published images of Merles before and have been asked for them on many occasions - but also because the setting works so well. I haven't published an image of a Bluebell wood before, either.